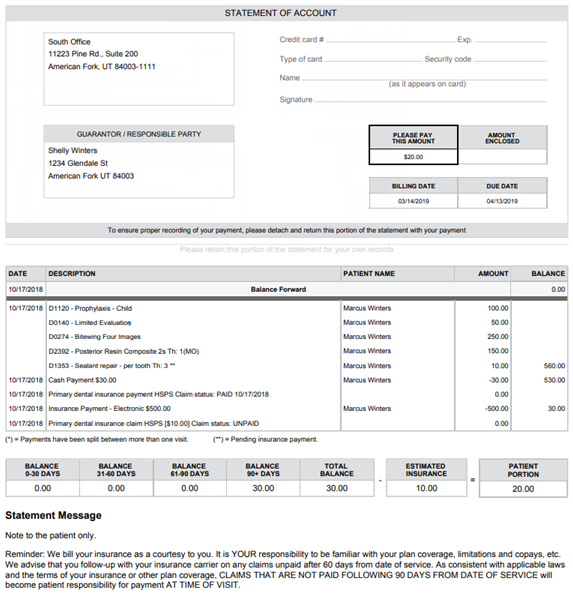 You can generate a billing statement for a specific patient or account. You can then print and send that statement to the patient or guarantor. While viewing a patient's record, on the Patient menu, under Financial, click (or tap) Billing Statement. The Billing Statement dialog box appears. 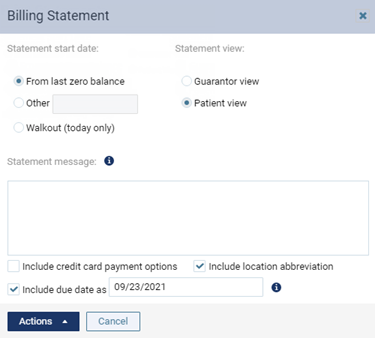 From Last Zero Balance - Select this option to include transactions that were entered on the account's ledger since the account last had a zero balance. Other - Select this option to include transactions that were entered on the account's ledger since the date you enter. The current date is entered by default, but you can change the date. Walkout (Today Only) - Select this option to include transactions that were entered on the account's ledger today. Note: On the statement, a balance forward amount will appear for the account's balance up to the specified date. Statement Message - Type a message that you want to have appear at the bottom of the statement. This message will be saved for the current patient (and appear on this patient's individual statements and walkouts from now on) when you click (or tap) Print. In addition to this patient-specific message, a general message may also appear at the bottom of the statement (if a default message exists for batch statements). Include credit card payment options - Select this check box to have credit card payment options appear on the statement. Include due date as - Select this check box to have the specified date entered as the due date on the statement. A .pdf version of the statement, which you can print, appears. Note: Printed statements fit in #9 single- and dual-window envelopes and #10 single-window envelopes. How do I remove the estimated patient portion from the ledger?